Working on an MFC app that has just been converted to Unicode (finally! ), I noticed that one button (which is created dynamically) is too small to fit the text in Korean (and Russian and a few other languages). It seems correct, but these script languages are throwing it for a loop–the measured size is much smaller than it should be. The GetTextExtent documentation doesn’t shed any explicit light on this subject, but may hint at it. The solution? DrawText. There is a flag you can pass to tell it to calculate the rectangle needed instead of drawing. It’s important to initialize the rectangle to zeroes because, as the docs say, it only modifies the right and bottom members of the rectangle. This entry was posted in Code, Tips and tagged Code, mfc, Tips, windows on April 10, 2008 by Ben. I tried using DrawText but it made no difference. However if you select the font first using GetDC->SelectObject(font) for the relevant font, then both GetTextExtent and DrawText work. …yes and be aware that above code leaks a dc, because the dc returns by GetDC must be released unless its a class dc. Thank you. Saved my day. 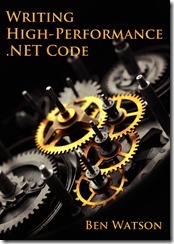 If you are a .NET programmer, you need a copy of my latest book, the best and most essential resource on .NET performance. Learn to diagnose, debug, and control your own code and the underlying CLR to obtain the fastest performance possible. Soon in a 2nd edition! .NET Rocks covers .NET Performance! Announcing Writing High-Performance .NET Code, 2nd Edition! This blog represents my own opinions and not those of my employer. This is my own personal work only. All comments are moderated. Comments containing abusive language, profanity, or are wildly off-topic will not be approved.